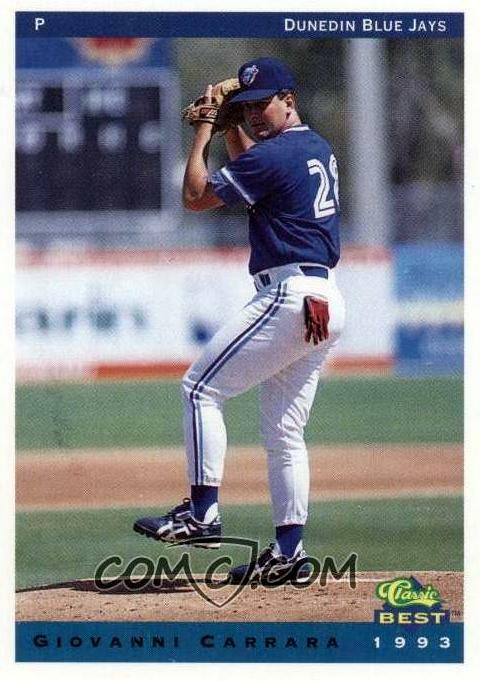 Born on March 4, 1968, Venezuelan native and international pitcher of mystery, Giovanni Carrara. This photo of Giovanni's A-ball duds--Dunedin played in the Florida State League--includes a splash of red from his batting gloves, a rare touch for cards of guys in a windup. It's likely from spring training, so the photographer might've pulled him off warmups or the batting cage to get his shot. Classic included Giovanni's 1990 and 1991 winter league stats for this #5, a practice seen on many minor league sets to avoid showing nothing at all. He pitched in Venezuela during MLB's off-season for 24 years, setting that league's mark for durability. 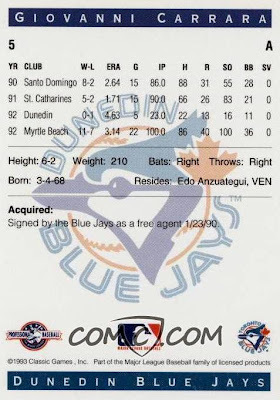 Carrara went on to pitch professionally on 4 continents, appearing in both the 2006 World Baseball Classic for Venezuela and multiple European Championships for Italy (career summary). Few of the 30 players in Classic's Dunedin checklist reached the majors. Besides Carrara, the best-known are Paul Spoljaric, Chris Stynes, and 1960s pitcher Bill Monboquette (as a coach). Value: This #5's listed for $3.20 on COMC and I assume 1990s minor league team sets run under $20, unless they include big stars. Fakes / reprints: I rarely find reprints of minor leaguers and find it hard to believe 1990s Classic would be vulnerable to counterfeiting.